The Intensive Care Unit at the Kaplan Medical Center has became known as one of the most successful critical care units in Israel, with a low mortality rate, and high ratio of patient recovery. Our ICU supports the performance of complex surgeries, including cardio-thoracic and esophageal procedures. The current ICU has eight active stations, equipped to care for critically ill and traumatically injured patients who need constant care and monitoring, utilizing hospital specialists from every field for consultations and support. 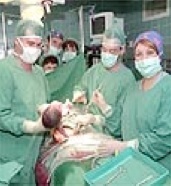 A staff of more than 10 people is involved in the treatment of patients suffering from acute respiratory failure such as severe pneumonias, patients suffering from severe infections, acute intoxications, snake bites, complex trauma with extensive vascular and organ system injuries, post-resuscitation patients, some post-surgical patients, and any type of acute or chronic disease which requires extensive monitoring and intensive treatment. In order to truly be ready to meet the challenge of saving more lives, we plan to build a new 1,500 square meter ICU above our recently built Emergency Room, and adjacent to the operating rooms and imaging facilities. The spacious ICU will include 12 patient stations, each equipped with the best life-support and vital statistics monitoring equipment medical technology has to offer. 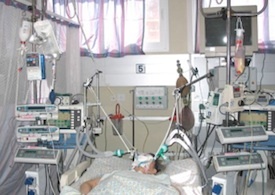 A fully equipped ICU bed requires a ventilator, a top-of-the-line patient monitor, a computer for data management together with the required software, over ten automatic syringe pumps to precisely deliver very strong and dangerous medications, and infusion pumps. Additionally, each station requires a complex support infrastructure including an oxygen delivery system, an air delivery system, at least 18 electrical outlets, and a vacuum delivery system with at least 4 outlets at each bed.